I'd say that The Vor Game is Miles and Gregor's Coming of Age novel, both stepping out of the shadows left by Aral and Simon Illyan... more so Gregor than Miles, I guess, on second thought. Keeping secrets is going to come back to haunt you. Aral and Simon find that out when Gregor, upon having learned of his father's perversities, throws himself off of a balcony in a drunken stupor - and, not having died, runs away. Only to be picked up by Miles during the latter one's mission to for once in his life do what others tell him, i.e. a reconnaissance trip to evaluate the situation in the Hegen Hub and the mysterious appearance of the Dendarii Mercenaries there. Gregor's an interesting character in the Vorkosigan-saga. We first encounter him at 5 years of age when Aral takes over the Regency. In Vordarian's pretendership it was of tantamount importance that he's free, at the cost of his mother's life in the end. Aral and Cordelia had a few years to educate him, but all within the restrictions of Barrayaran customs. But it's enough to say that the Vorkosigans are the closest thing to family that Gregor has. But he's prone to insecurities. He couldn't choose his job, a job that Aral did so effortlessly, and that Gregor feels ill suited for. He didn't know what actually led to his father's death. He's trying to get out of Aral's shadows, only to find himself used time and again. So his tumble off the balcony doesn't really come as a surprise. But, to his credit, he's learned from previous experiences (Warrior's Apprentice) to realize when he's being played. And with Miles' help he's facing his demons - and his duty. And he's finally taking the reins in leading the Empire - something Aral and Simon have been working for, and even if they didn't expect it at this moment to happen, they welcome this development. Much of Gregor's story has been told with this book. He remains a steady, benevolent force in the background, and only comes forward again during his courtship, but he left an indelible impression on me as a character thrust into a position of power, one that he doesn't particularly want, but that he's nonetheless suited for. From this point forward he's no longer being guided, but the guide himself for the Empire into progress. Now, Miles is another case entirely. By chance he found himself in command of a fleet back in Warrior's Apprentice - and he liked it, especially not being questioned due to his physical handicaps, but only because of his command decisions. With the Dendarii he can be himself - or at least the himself he'd like to think of being. Cordelia later on tells Mark in Mirror Dance that Miles is just as damaged by his upbringing as Mark, having to run away from Barrayar, creating his own personality and manipulating everything around himself to fit this vision, just to escape a planet's expectations. And it takes about 10 years for Miles to become sufficiently self-reliant to be able to divest himself of Admiral Naismith and assume his position in Barrayaran society. It's always good to see Aral and Cordelia acting as Miles' parents while juggling the fate of the Empire. I love the picture of Aral's using his lunch break to be with Miles, I absolutely adore the reunion of father and son on the Prince Serg, Aral's exasperation with Miles - and the deep affection and love that's so obvious in these little scenes. It's to Bujold's credit that, while there are societal issues that left an indelible imprint on Miles' personality, she didn't feel the need to add further problems at home... not that there aren't enough problems already with a grandfather who tried to kill him. At least he can rely on his parents who support him as much as they can even if their position in Barrayaran society and therefore the expectations for their son isn't an easy environment to grow up in. And so even despite their love he has to essentially face the same questions as Gregor: Who am I? What do I want? How do I get out from under my father's shadow? What do I believe in? And what am I willing to do in order to achieve my goals? It's definitely good to see the Mercenaries again, Elena, Bel Thorne, Tung, Baz, Arde... they feel very familiar and, due to their own unique upbringings, closer to Miles than his dearest friends on Barrayar. And I enjoyed the glimpse into the broader political landscape of the Vorkosiverse with the imminent Cetagandan attack on a vital region of space - maybe even the precursor of another attack on Barrayar itself. There are so many interesting tidbits hidden in the narrative of events during the Regency that I would I would love to see... but that so far haven't seen the light of day yet. As I've written in another Vorkosigan-review, I'd love to see an anthology set in the time of the Regency where the political landscape was still malleable and outside attacks an imminent threat. Overall, The Vor Game marks the start of Miles' career as Admiral Naismith - and as a covert agent in ImpSec. Bujold manages to combine Barrayaran internal politics with galactic adventures which makes for an entertaining ride. 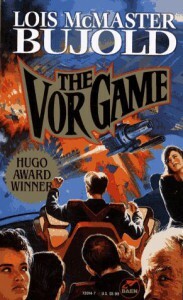 Not my favourite Vorkosigan book (What can really compete with the likes of Memory or A Civil Campaign? ), but still top-notch quality!